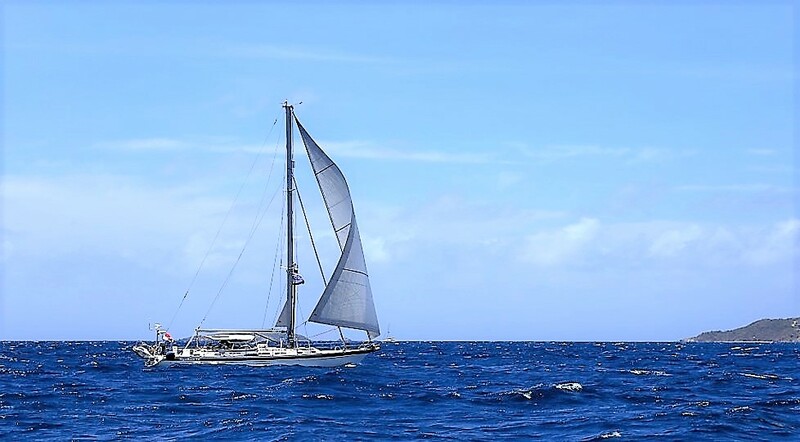 Ngahue IV is a Hallberg-Rassy 53, which between 1992 and 1997 was the flagship in the HR range of yachts. Hallberg-Rassy Varvs AB is a leading Swedish boatyard, based in Ellös, just north of Gothenburg on the West coast of Sweden. The fascinating company history of Harry Hallberg and Christoph Rassy can be read on the HR website. The company is currently managed by Magnus Rassy, the son of Christoph Rassy. Magnus Rassy brings a passion and modern vision to the company's range of yachts which is truly unique and will certainly prolong Hallberg-Rassy's reputation as THE boat that everyone wants to own! Indeed, each year the leading German magazine Yacht publishes a readers' survey on their most desired sailing boat and Hallberg-Rassy for the last many, many years has come out tops! Hallberg-Rassy built 88 units of its HR53 model between 1992 and 2006. Ours is hull number 19, completed and launched in May 1995. Some time ago, Hallberg-Rassy updated the Previous Model HR53 web-page on the company site. Via this link you can find out more about this model, see plans, photos and read a commentary from its designer, the well-known Argentinian naval architect Germán Frers. Ngahue IV was acquired by us - Marco & Laura (for more on us, see The Skippers' page) - during the winter of 2015/16. She was at that stage already a venerable lady of some 20 years of age. But as the bigger Hallberg-Rassies are generally built like tanks (dixit Carl Adams of Adams Boat Care, a Yard that specialises in refitting Swedish yachts and Hallberg-Rassies in particular and which is situated near Ellös), and our future boat had spent much of her life in the Baltic Sea, her age was of no real concern to us. Under the two previous owners, Ngahue IV was respectively called 'Christina' and 'Tabaluga' (the latter name being a green dragon in a children's television series on German TV). We bought our boat from Herr Dr. Bierhoff, owner of 'Tabaluga', when she was based in Kiel, Germany and renamed her Ngahue IV, my fourth Hallberg-Rassy yacht to have this Maori (New Zealand) navigator's name. Dr. Bierhoff returned to Hallberg-Rassy sailing in April 2019 with an HR54! The first Ngahue, a Hallberg-Rassy 29 which I owned from new from 1990, is very much alive and well and still sails out of the Poole (UK) area; she looks as good these days as in August 1990. We actually crossed tracks with her in the summer of 2018, and her general condition says something about how well Hallberg-Rassies keep when they are well-looked after. Ngahue II, an HR37 which I also acquired from new in 2004, is successfully raced and sailed by Ron Houston in the U.K. and beyond. The former Ngahue III, an HR43 also from 2004, and which I acquired in 2013 has embarked on a new future under a new name with another Dutch owner from Friesland. We were told that he plans to do some serious long-distance sailing in her. Germán Frers, the successful Argentinean naval architect who has designed all Hallberg-Rassy yachts since 1989 (when he started with the HR45) and whom we had the honour and pleasure of shaking hands with at the 2017 Düsseldorf BOOT show, developed this excellent 53-foot design (which is actually some 54 feet long - or 16m44 in metric terms). He came up with an ocean-going boat that is both fast (at least she was considered as such in her days) and very comfortable. He described his design as "graceful elegance, which will be maintained regardless of time". We fully agree with this assessment, and always recognise "our" boat out of dozens in marinas and anchorages. To find out more about Ngahue IV, simply browse our web-site and click on the different headings in the left column. These will take you to the relevant (sub)pages. To see where Ngahue IV currently located, we've added a "Yellow/Brick" page with a link to our position tracker. This shows our trip since February 2018, starting from Antigua, when Laura first programmed our Y/B tracker. The Yellow/Brick page is the last link in the left-hand column. Since January 2019, we have also created a Ngahue IV page on Facebook. It took us some experimenting with different page-settings to get there! Here's a link to Ngahue IV on Facebook which you are most welcome to visit and follow. Last update: 20th April 2019. For what's new/updated... click here.